09.07.10 POTD, originally uploaded by Sarah (SarahDanyelle). When I was over at the in-laws on Sunday, my father-in-law gave me this gem to add to my collection of old cameras. 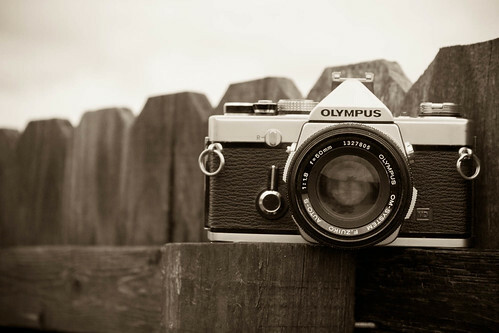 It's an Olympus from 1979 and it's pretty cool. There was actually still a roll of film in it which we carefully rewound in hopes that maybe he'll get it printed. It also came with a super zoom lens as well, but the regular one made for a better photo. So now I think I am goingt o have to print all my camera shots and display them together!